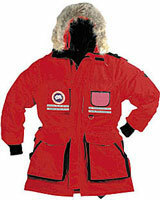 Poly-cotton Arctic-Tech outer-shell is treated with Teflon fabric protector. Free hanging, 100% down- proof nylon lining. All goose down filled body, sleeves, cummerbund, wind-flap and hood. Two-way heavy duty YKK front zipper. Fleece lined and Velcro secured wind flap. Two-way YKK side zippers for easy pocket access. Built-in fleece throat-latch for added protection against arctic winds, conveniently folds away for easy storage. Two bellows chest pockets with Velcro secured ID pockets. ID window tucks away when not required. Nylon reinforced lower side entry pockets. Heavy-duty, oversize, nylon reinforced, knit cuffs. Inside walkie-talkie pocket with adjustable flap closure. 3M Reflective tape across back and on front chest pocket pull-down panels for increased visibility. Two-way drawstring hood closure with concealed adjustable strap. Tunnel hood with adjustable bracing wire and detachable coyote fur ruff. The ultimate in cold weather performance, the Snow Mantra TM is the best Parka we make. The array of technical features on this jacket is unprecedented. A jacket that is sure to keep you warm in the absolute coldest places on earth, this parka has become the mainstay on North American continent and abroad. Ask anyone who knows. Canada Goose, 91 Tycos Drive, Toronto, ON M6B 1W3. Tel: 416-780-9850; Fax: 416-780-9854.